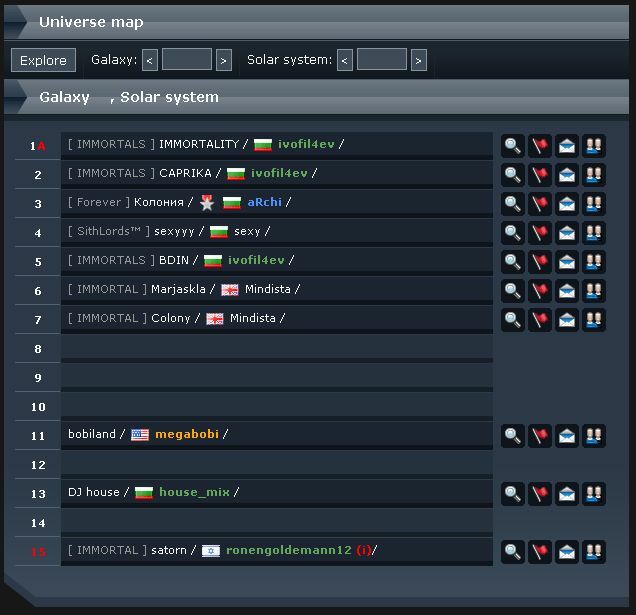 The galaxy map is the most frequently used menu of all pilots. It provides information about your place in the galaxy, who is your neighbors, what is the chosen player status – available for attacks, vacation modes, last online. 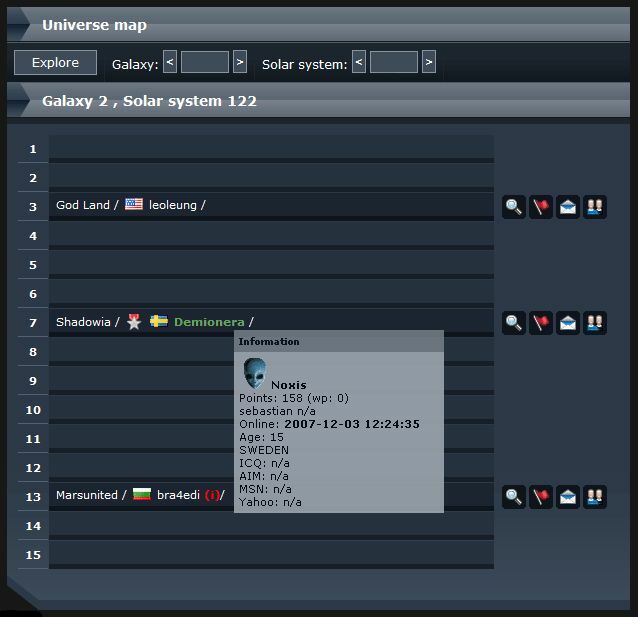 Use the arrows on top of the map to navigate through the universe. If you want to see a specific coordinate, enter the number and click on the “Explore” button. blue - account in vacation mode – inactive and no attacks allowed. There are few icons and signs around a player’s name. violet - your alliances are Allied. After his name you see his planet name and his Country or Alliance flag. If the player is marked with (i) that mean an inactive player, open for attack for everyone. Exceptions of the rule are the Bulfleet Generals. Their accounts become inactive – marked with (i) at the 14th day of inactivity, but they become open for attack after the 20th day or if their General status ends before day 20. (X min.) behind the player name shows the Last online activity. - - in front of player’s name – the players is Bulfleet General - Game Guide. You can ask him different question about game features and tactics. - player with active Bulfleet Widget. There are 4 icons at the end of each inhabited coordinate. 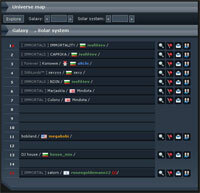 - Quick launch of Spy probe. - Shortcut to Fleets menu with saved coordinates. - Shortcut to Personal Message menu with saved name. - Shortcut to Friends menu with saved name. If you point the name of the chosen player with your mouse, you will see a tooltip with his Value points, War points, Last online time, Active protection and period if any and some optional personal information. If you see a red digit in the beginning of the row – e.g. 8, that marks the presence of a Recycle field at these coordinates, which you can gather with recycle ships. Pointing the mouse over it will show you a tooltip with its value. A click there sends you in fleets menu with saved coordinates. If you see a red letter A next to the planet number, that means an Asteroid with Gas. Pointing the mouse over it will show you a tooltip with its speed and time for the next coordinate change.